Americans struggle to determine what news and information sources they should trust and how to discern reliable information online. They worry that fake news is sowing confusion about current events. And many express a desire to get help. About six-in-ten adults (61%) say they would be helped at least somewhat in making decisions if they got training on how to find trustworthy information online, according to a new analysis of Pew Research Center survey data from 2016. What’s more, a majority of Americans say public libraries are helpful as people try to meet their information needs. While the library is seen as one useful resource, the survey also found that 55% of adults say that training to gain confidence in using computers, smartphones and the internet would help in making decisions. Blacks and Hispanics are more likely than whites to believe training would help them, both in how to use online resources and in gaining confidence with digital tools. Similarly, those with less than a high school diploma are more likely than those with at least a bachelor’s degree to think training would help. And women are slightly more likely than men to express this view. 65% say libraries help them grow as people. 49% think libraries help them focus on things that matter in their lives. 43% believe libraries help them cope with a busy world. 38% say libraries help them cope with a world where it’s hard to get ahead. 27% think libraries help them protect their personal data from online thieves. Beyond generational differences, there are some other demographic differences in views on how libraries can help. 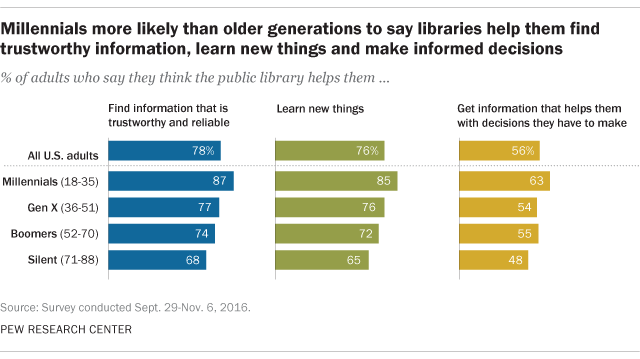 Women are somewhat more likely than men to report that libraries help them find information that is trustworthy and reliable (82% vs. 75%), learn new things (80% vs. 73%), grow as a person (69% vs. 61%), focus on things that matter in their lives (54% vs. 44%) and cope with a busy world (47% vs. 38%). Hispanics are especially likely to say that the public library helps them learn new things, grow personally and focus on things that matter in their lives compared with smaller shares of blacks and whites who say the same. 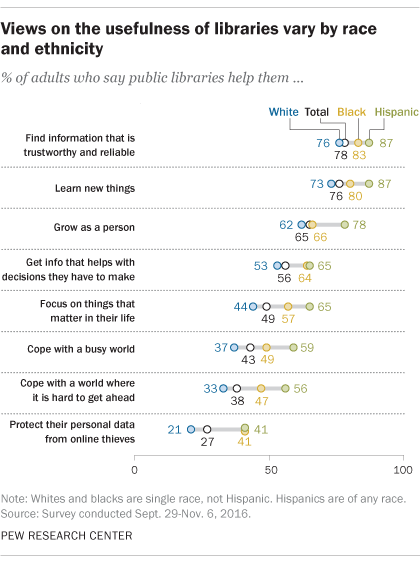 Hispanics are also more likely than whites and blacks to say the library aids them in coping with a busy world or with a world where it is hard to get ahead. Note: See full topline results here (PDF). Read more about Americans’ engagement with libraries and library resources in a 2016 Pew Research Center report.